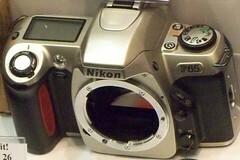 The Nikon F65; also known as the Nikon N65 in the United States or the Nikon U in Japan is a 35mm entry level SLR camera released in 2001. This model was available for a brief time as two years later the F75 / N75 / U2 replaced it. The camera features many common programmed exposure modes, but also included exposure compensation. It is quite easy to press the compensation button on the camera shoulder by the LCD and rotate the thumb dial to change settings from ±2 EV in ½ steps. These values are displayed in both the LCD as well as the view finder. The compensation is retained in the exposure modes until the program dial is switched to Auto or M.
The metering has very good range at 1 to 20 EV at 100 ISO using a f1.4 lens. An electronic self-timer mode is available, by pressing a button on near the program dial. With additional presses the same button also switches between remote control modes. The film transport is the motorized automatic type for advance and rewind. 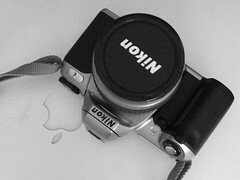 Film is automatically advanced to the first frame when the back closed. It is capable of advancing up to 2.5fps. Mid-roll rewind is possible by pressing and holding both the rewind buttons. The date versions of the camera uses a CR2025 coin type battery located in the camera back. It has a 24 hour clock with an accuracy of ±90sec a month. Leap year adjustment settings to December 31, 2049. It can print in multiple formats including M/D/Y, D/M/Y, Y/M/D, D/H/M, and no imprinting. 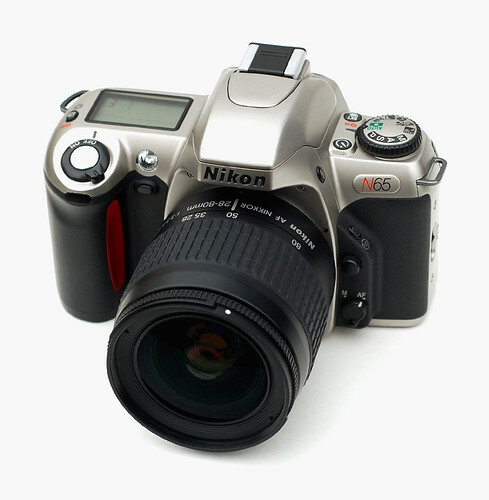 It can only use DX coded film, non-DX film is set at 100 ISO, and infrared films cannot be used in the camera. Acessories available for the camera includes MB-17 battery grip that takes four AA batteries. A remote control unit ML-L3 can be used similar to self timer with a 2 sec delay, as a remote cable release or can also be use to focus by half pressing the button. It uses CR2025 battery. 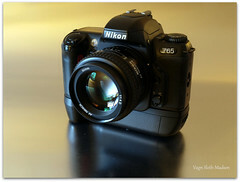 Shutter: CPU-controlled focal plane shutter with speeds 30 - 1/2000 sec. This page was last edited on 18 December 2013, at 05:14.